I had a the same Problem and after a little research this is what I did, - Remove headlight, remove covers and dry it out. - Once dry carefully remove the headlight gasket (This is the gasket that Wraps around the sides and top of headlight assembly) - With a soft bristle brush and some alcohol thoroughly clean the seam where the two headlight halves meet. - Once dry apply flowable silicone in the seam where the two headlight halves meet. - Allow to cure for two hours, re-install the headlight gasket, and install the headlight back in its place. ecstuning.com will have a few good sparkplug replacement kits. Pommy, Could you please be more specific, I'm having a similar issue, what breather valve, part # ect... Thanks in Advance. I just replaced the blower motor resistor and the problem stays the same, I don’t know what else to look at. Any help will be appreciated. I'm, going to be doing my oil change this year on my 2010 Porsche Cayenne V6 and I was wondering if someone knows what the torque settings are for the oil pan drain plug, oil filter drain plug and oil filter cap is? Thanks in advance. Hi, I have a 2010 Porsche Cayenne base and the drivers seat has no memory, what parts do I need to upgrade my seat to have memory controls? Thanks in advance. Thanks, I’ll look into getting it changed then, is there any additives you would recommend adding, or just fluid and filter change? Hi, Everyone, I am new to this forum and first of all I would like to say that this site is the best for information on maintenance, repair and tips of all Porsche sites on the web. 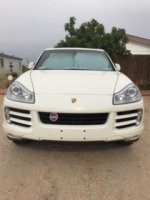 I am currently a new owner of a 2010 Porsche Cayenne Base with 70,000 miles and so far except for the clogged cowling and a/c drains that i fixed (thanks to this site) it has been the best car I have owned. My question is, the owners manual says that the ATF should be changed every 160,000 miles or I think 12 years. Is this safe or should I be doing it more often regardless of what they say. What do you experienced owners recommend, I Love this car and I want it to last as long as possible. All previous maintenance had been done at the stealership and I don't see any record of them changing the ATF before I got it. Thanks In advance.